The news that Ed Carpenter will be driving for Sarah Fisher Racing in 2011 is a welcome development in my eyes. I know he’s got his critics, but I’m a big fan of Ed as an oval-only specialist. He’s shown a lot of speed at places like Indy and Kentucky, and came close to winning at Kentucky. My only quirk/quibble is wondering how he’ll do in SFR’s equipment. He was darn fast in a Panther car, but can he keep that up at Kentucky in Fisher’s equipment? Those tubs last year were not exactly gangbusters--hopefully in this last year of the old Dallara, they can scrounge up a newer/better chassis. One thing’s for sure; as soon as I can, I’ll have a #67 decal on the back of my car. Gotta support the hometown hero and the pioneer, after all! This will be an easy team to root for. Bertrand Baguette was not only one of the most impressive rookies on the IZOD IndyCar circuit last year, he's also got some excellent international chops. How's so? Oh, how about beating F1 legend Michael Schumacher in his first heat in the Race of Champions? Team Germany may have won overall, but Baguette and Team Benelux have nothing to be ashamed of. I liked Baguette this past year because he kept his nose clean, stayed out of trouble, and showed some serious talent. With being linked via rumors to Conquest or even Panther, he's a good shot to return and improve in 2011. He certainly doesn't sound to be interested in F1 anymore, which is IndyCar's gain. Plus, he's IndyCar's most potentially-nicknamed driver, with Triple B, The Breadman, Baggy, Bags, and Big Bad Bert just some of our potential entries. I was so very thrilled to hear yesterday the the Edmonton City Council voted in favor of continuing their annual IndyCar event. I know a lot of great IndyCar fans had a lot of emotional investment in this one, and it's a great win/hold for the IZOD IndyCar series and fans. As I've said before, I'm not an insider, and I'm generally not in the sort of circles where a lot of behind-the-scenes stuff goes on. I'm a die-hard, regular IndyCar fan. And in that capacity, even with last year's controversial finish, Edmonton has been one of the best of the twisties to watch. On a related note, as a fan, I almost feel like I'm holding my breath as of late. With all this good news as of late, it seems like cosmically we should get some dire news to balance it all out. Then again, we had plenty of bad news over the past decade. I guess we were due, huh? Right now, it seems like every other day spells another exciting development for IndyCar. If trends hold, next week should be pretty great as well, as we hear Sarah Fisher Racing's driver announcement. In an offseason stretch that has seen more good news than most people could have ever hoped for, I wanted to take the opportunity to wish everyone at the IZOD IndyCar Series, the Indianapolis Motor Speedway, and all my fellow IndyCar fans the happiest of Thanksgivings! -Multiple engine manufacturers for 2012, and multiple aero kits in the works, as well. -It sounds like the Edmononton IndyCar race may not be canceled after all! -Graham Rahal. Full-time. Oh yes. -Advocate Fave Bertrand Baguette is sounding probable for a return next year, and is competing at this weekend's Race of Champions (h/t to the most excellent ...and he's on it). -Helio's new sponsorship for 2011 (I'll bet that is going to be one good-looking car! -IZOD has been a wonderful series sponsor. I'm definitely thankful for them. -Randy Bernard has been everything we could have asked for in the top spot of this series, and so much more. He's such a blessing, an asset, and a hope-builder for those who love, follow, or find employment in this sport. IndyCar right now is a lot like life; there's a lot of challenges, but there's plenty of good stuff, too! Happy Thanksgiving! But there is no joy in Naptown - mighty Hobbson has closed out. We'll miss you, Silent Pagoda. On behalf of everyone, Roy, start a new blog. Hell, I'll give you this one. Just don't stop writing. This Veteran’s Day, we honor and respect all those veterans, past and present, who gave so much for their country and for freedom, even unto the last full measure. Without you guys, we wouldn’t have the freedoms we do now. For that, we cannot honor you enough. For all my brothers-in-arms, thank you. You were and are an inspiration, and the true example of heroism, duty, and selflessness. As many have speculated and has come to light in recent days, it's really looking possible that we might see Fiat and/or Chevy/GM join Honda as engine manufacturers in 2012. Right now? Right now we wait for Friday's big announcement, and hope it's as firm and concrete as we're hearing. Then, we allow the rejoicing to begin! 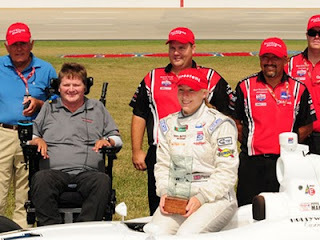 Pippa Mann is one of my favorite Indy Lights drivers, and one I hope will soon be making the jump to IndyCar. This year, she became the second woman ever to win an Indy Lights race (at Kentucky) while driving the wheels off her car--especially in the second half of the season. She was kind enough to answer six questions about her career, her season in review, and her expectations for the future. When did you first realize you wanted to be a race car driver? PM: I first realised I wanted to be a race car driver during my first full season of driving karts at the age of 13. I think my family thought it was just infatuation with a new hobby, and that it would pass...! Needless to say, it never did! The interesting thing about my story is that before I first ever drove a kart, just a few months earlier, it never even crossed my mind. I knew I liked watching racing. I knew I liked cars, and going fast in cars. But in Europe there were almost no female drivers at all, and the idea that I could or would drive a race car never even entered my head. Then one day I got into an indoor kart at a little track near my home. I progressed from there to racing in Italy and qualifying to race in the World Championships at a senior level against all the paid professional drivers in just over five years! Outside of Indy itself, what’s your favorite track on the current Indy Lights circuit, and why? PM: I think Sonoma is probably my favourite track on the schedule for 2011 outside of Indy. It's a fast, flowing road course that rewards being able to really dial the car into it with a smooth driving style. It's actually very European in many ways, and very reminiscent of the tracks I grew up racing on. Your first win at Kentucky had to be pretty special. When did it sink in that you had won, and is there any way to describe the feeling that accompanied it? PM: I actually don't think it really sank in until after the race in Homestead, where we didn't win that one! I had been trying to go for two out of two, and was fairly confident we could achieve it, but we just went a touch too conservative in the race expecting the track condition to be much more slippery than it was. I think that's when it sunk in just how well we as a whole team on the #11 car had done everything at Kentucky! Most people describe winning as "elation", but for me it was a much quieter emotion. Yes, I was extremely pleased, and suffering slightly from disbelief that when we had won, we had won by that much. I think I was also suffering from disbelief that nothing outside of my control had gone catastrophically wrong in the last few laps, so we really had won! But I think the main emotion, was actually satisfaction. I knew that with this team, the crew of guys on my car, my engineer, this year we could and would win a race or two. In Chicagoland we came so close, then in Kentucky we brought it home. I knew and believed that, but I don't know how many other people truly believed that. So being able to show case to people what we could do when we got it right, what I am capable of as a driver when we get it right, that just bought an amazing sense of quiet satisfaction. Also I think also pride - I was so proud of my guys for what they achieved that weekend too. They deserved that win just as much, if not even more than I did! Most of us have never been in an accident in any sort of vehicle traveling the velocity of IndyCars or Indy Lights. What goes through your head in an accident like the one you had at Indy this year? Does time seem to slow down, or is it over in a flash? PM: Accidents in racing cars nearly always seem to happen in slow motion. You see it coming, and you're doing everything you can to avoid it happening, but often in real time, there just isn't enough time to get the car saved, or get out of the way! After you hit the wall everything seems to speed back up to real time though, and then it's over pretty quickly! If you weren’t going to be a race car driver or in racing, what other profession could you see yourself pursuing? PM: That's a really interesting question! I think since I discovered racing, I would have struggled to be involved in a profession that wasn't centered around racing. I have always enjoyed writing, and I've never enjoyed being in a confined office space from nine until five on a regular basis, so I guess I would have tried to go into either the journalism or PR side of the sport - something that kept me close and involved in racing, even if I wasn't behind the wheel of a car! What are your goals for next year? Anything coming together for a peek at the IZOD IndyCar series or the 500? PM: My goal next year is to be racing in the IZOD Indycar series! We have some good things on the table right now, so I'm just crossing my fingers, continuing to work hard, and hoping one of them turns into reality. I would love to be able to do a full season, but if that's not possible, we're already working on various contingencies to run a partial season instead. There's obviously the option of trying to run an oval program, or even run just enough races to get some experience and keep my rookie status for 2012. I would say as of right now there's a high percentage chance I'll be out there, and I'm extremely excited by the opportunities which seem to be unfolding! Is There A New Title Sponsor On The Way?